Would you like to go wherever the hell you want? 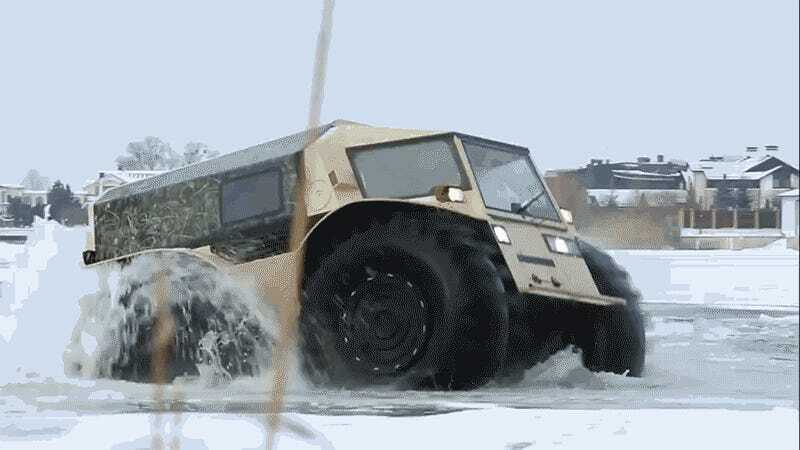 Using its self-inflated tires, Russia’s SHERP ATV can give you that pleasure. It will climb over obstacles as tall as 27.5 inches, swim with ease, turn like a tank and look awesome in any situation for only $49,000 worth of Rubles. While it comes with a tough polymer coating and a 15.3 gallon fuel tank as standard, with a bit of extra money, you can equip yours with anything from a high-power generator and a light bar to a trailer and a hard top. A McLaren F1 and this, and you’re done. You don’t need anything else! Hat tip to Top Gear!